We’re closing on our house in less than a month, which means that I finally get a garden of my own—one that’s in the ground instead of in pots that can move with me. I have the patch of lawn all picked out in the protected courtyard next to the greenhouse. And, feeling inspired by the organic gardening class I finished a few weeks ago, I’ve designed the vegetable garden, the strawberry garden and made preliminary plans for the landscaping in the front. The latter I’ve planned and erased several times, and will probably plan and erase another ten times before I even break ground. Planting a garden from scratch is going to be a learning process. While I helped my parents with our gardens growing up, I never helped with the initial digging and labor. So far, I’ve learned a lot. Have a contingency plan. The carrots that I started from seed in the greenhouse haven’t erupted from the soil yet. 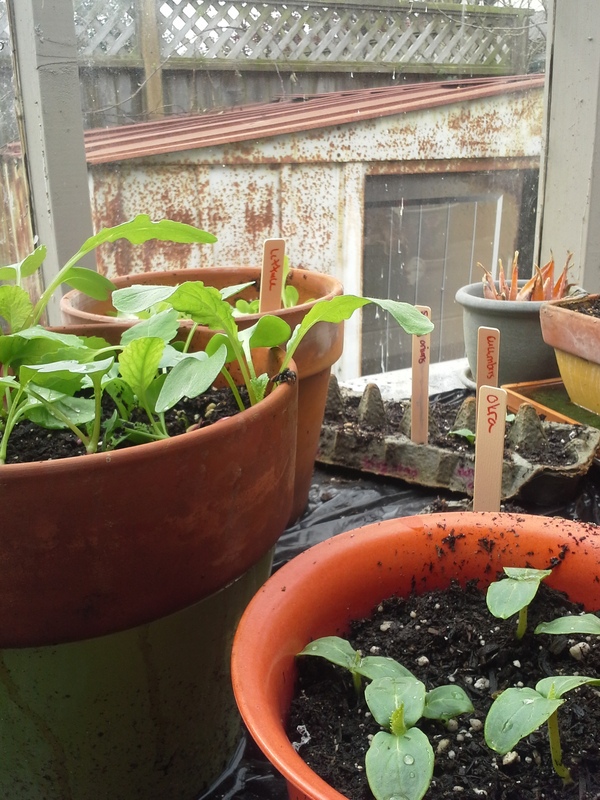 Now, it’s only April and I realize that it may take a while, but I’m planning to replace them with something else in the garden if they don’t sprout (most likely with some sort of lettuce. Lettuce grows quickly and seems to love me). That way, there’s always something in the soil that’s growing. And, if they do sprout up, then I can transplant them into a smaller patch than I had intended. Plant what you love. Two years ago I planted zucchini, and thinking that it wouldn’t do well, I planted six plants. Well, it loved the San Diego sunshine so much that we were bombarded with more zucchini than we knew what to do with. We couldn’t give it away fast enough. I like zucchini, but not pounds and pounds of it. So, in the new garden, in our new home, I’m only planting two or three plants—enough for a stir fry or two and maybe some zucchini bread, but not enough to overwhelm us. This time around, I’m planting the vegetables that we love and always buy in the grocery store every week. Lettuce and spinach do really well up here, and we’ll be able to grow them in the winter as well in the greenhouse. Add into the mix cucumbers, bok choi, tomatoes, garlic (lots and lots of garlic! ), green beans, strawberries and a few other token things like habanero peppers and cantaloupe. Everything I’m growing I know we’ll eat. In fact, I just harvested some bok choi, lettuce and dill that I grew in the greenhouse and it was delicious. Be flexible. Sometimes things won’t grow and sometimes your garden will be infested by vermin and bad bugs (like ants, my nemesis). That’s the way it goes. Deal with it and move on. Now this attitude may change when gophers circumvent the gopher wire and manage to decimate my spinach, leaving me to patrol my garden all night with a rifle in hand because our cat is lazy, but for now, I’m going to take the mellow approach. We’ll see how that goes. This attitude also translates to the front garden. Right now, I want to plant a couple of cherry trees, lavender, lupine around the border, roses and rosemary. But, some of these might not work out, or I might think that wild lilac is the best thing ever and decide to plant it everywhere. What’s great about gardening is that most things can be transplanted elsewhere.